How do genes cause anatomy? A) Stimulating cyto-differentiation at specific locations. B) Differential growth and mitosis of cells. C) Movements & rearrangements of differentiating cells. Higher plants have no cell locomotion; (no "C", above) So plants create anatomical shapes using only A & B.
Incidentally, there is a large field of research which is the plant equivalent of embryology. Much of it is about auxin, ethylene and other low molecular weight plant "hormones" that control locations of cell growth and mitoses. In graduate school, I was very lucky to be required to take a one-semester course on plant development taught by Ian Sussex and Arthur Galston. If you want to learn more about this subject, I can guide you. The UNC Biology Dept. has many researchers on Plant Development. Historically, researchers have tended to guess that localized and directed growth of cells should be used to create anatomical patterns and movements. But such explanations consistently turn out wrong. Epiboly in fish gastrulation was thought to be pushed by cell growth; But researchers discovered that the real causes were locomotion of enveloping layer cells combined with spreading of the yolk syncytial layer. Neurulation was claimed to be pushed by cell growth; but was discovered to be pulled by acto-myosin contraction of the neural plate's concave surface. The theory that enlargement of blastocoels gets pushed by directed mitoses was supported by correlations between times of mitosis and times of increased volume. But water is actively pumped into blastocoels, which collapse if punctured, and then quickly re-inflate. Budding of Hydra, sponges etc. was long assumed to be produced by localized and directional growth of cells. Labeling studies prove that the real cause is cell rearrangement. Tentacles are made of cells that had been part of the trunk, which spontaneously rearrange to make narrower cylinders. "Feather germs" are the mesodermal precursors of bird feathers and reptile scales, and are formed by localized spots of higher cell population densities . Their highly regular positions were believed to result from more mitoses at those spots. But it turned out that mesenchymal cells get pulled into clumps. Eruption of teeth is still assumed by most dentists to be driven by pressures of localized cell growth by cells between each tooth. However, surgical removal of tooth roots in rodents did not slow down tooth eruption. One theory is that traction is exerted by mesenchymal cells adhering to sides of teeth. 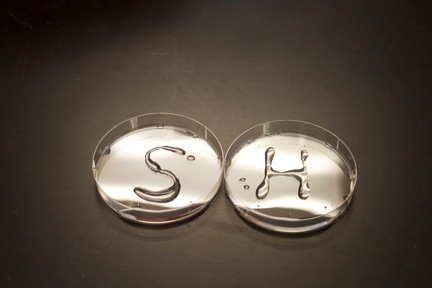 This photograph shows "wetting" of S-shaped and H-shaped areas of polystyrene Petri dishes on which sulfuric acid had been used to write these letters. Many structures of the body are mechanically equivalent to water balloons. Each has a interior pushing out, inflating a flexible surface. b) The brain, and the rest of the central nervous system, are a hollow, fluid filled tube. The pressure of this cerebro-spinal fluid inflates the brain more than the spinal cord. Lobes of the brain are created by more inflation at certain places than elsewhere. A simple experiment is to poke a small hole in any part of the neural tube, and reduce the pressure to near zero. Insertion of a hollow glass tube will prevent the hole from closing. This results in the brain lobes not inflating. d) Teleost oocytes form their upward-bulging blastodisc by cytoplasmic pressure pushing against a circle where the contractility of the cell cortex is weaker than elsewhere. e) Cleavage (cytokinesis) of all animal cells is caused by strengthening of cytoplasmic acto-myosin in the circumferential direction in a belt-like contractile ring that pinches the cell in two after mitosis (And separate from the mechanism of chromosome movement in mitosis). f) Polar body formation is a special unequal form of cytokinesis, that follows each meiotic division of oocytes. g) Cartilages expand by electro-osmotic pressure pushing outward against resistance of collagen and elastin fibers. These fibers wrap around the outside of each cartilage, and also run through the interior of the cartilage. Visualize water balloons with very gooey water inside, and with nylon threads and rubber bands wrapped around the outside, and also running through the interior. h) Notochords are tightly packed with weak, vacuolated, jelly-like, cells; and are tightly wrapped with sheets of collagen fibers, running in spirals. i) Blood vessels (arteries, veins, capillaries) are lined with a special kind of thin epithelial cells named "endothelial cells", which are wrapped by collagen fibers, smooth muscle cells, and fibroblasts. It's an unasked mystery what mechanism wraps them with collagen. Another is why smooth muscle cells orient circumferentially; perpendicular to what contact guidance usually produces! j) The chambers of the heart? This was not shown in class, but please watch it. A straight line has zero curvature. A circle has constant curvature. Curvature of small circles is larger than curvature of big circles. A sphere has constant curvature in all directions. A plane has zero curvature in all directions. Differential Geometry is a division of higher mathematics in which shapes are defined in terms of curvatures, instead of the x, y, z coordinates that we learn about in elementary mathematics. Everybody but mathematicians is much more familiar with Analytic Geometry, which defines shapes in terms of x, y and z coordinates. That is why Lewis Wolpert's "Theory of Positional information" is so plausible and widely believed. He claims anatomical shapes have to be caused by perpendicular diffusion gradients, that act like the x, y and z coordinates. Such gradients have actually been discovered, especially in early fly embryos. Examples include the Bicoid protein, "Sonic Hedgehog", and retinoic acid. But counter-balances of pressures and tensions are just as important: development is a mixture. 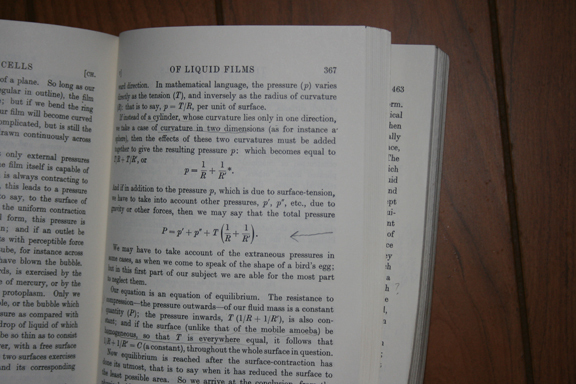 Nevertheless, Positional Information is somewhat analogous to "The Ether" in Physics before 1905. Pressure difference equals Curvature multiplied times Tension. dP = T x (1/R + 1/r) Which assumes that tension is the same in all directions. For soap bubbles, tension really is the same in all directions. This and other simple mistakes have led biophysics down a blind alley. How to think about quantitative variables that vary with direction? (like curvature, tension, permeability, strain, and others). Variables that don't have any directionality are called scalars. Chemical concentrations, density, temperature, osmotic pressure, & hydrostatic pressure are scalars. Scalars have an amount at each location, which can differ with location; but has no direction. Vectors have an amount and a direction at each location. Electric fields are an example of a vector variable. Curvature, tension (equals "stress", which includes tensile stress and compressive stress) and "strain" and permeability are all examples of variables that can and often do have different amounts in different directions. Variables that differ with direction are called tensors, and unfortunately are not included in the education of anybody but mathematicians and some engineers. In my opinion, tensors are more important for embryology than vectors. 1) Curvature, stress (tension) and strain (% distortion produced by stress) are second order symmetrical tensors. 2) (most) Vectors are considered to be first order tensors. Scalars are zeroeth order tensors. 3) Elastic moduli are fourth order symmetrical tensors. That means their variation with direction can be more complicated than if they were second or third order tensors. 4) The word "Symmetric" applied to tensors means that for every two opposite directions, their value is the same. 5) For second order tensors, if they vary with direction (which they CAN, but don't have to), their minimum and maximum directions are always exactly perpendicular to each other. D'Arcy Thompson's biggest mistake was to treat mechanical tension as if it could not vary with direction, which greatly narrowed and reduced how many geometric shapes he could "explain". He could only recognize the possibility of direct causation by forces when objects had shapes that could be produced by tensions that were equal in all directions and at all locations. (spheres, catenoids, etc. the sums of whose curvatures are constant everywhere, as in soap bubbles). It is a tragedy that so many people have such strong positive or negative responses to D'Arcy Thompson, but nobody analyzes his tacit assumptions, nor why these assumptions are misguided. Incidentally, tensors played a major role in the escape of physics from the "ether" concept, which was analogous to "positional information" in today's embryology. D'Arcy Thompson mistakenly persuaded himself and his readers that self-building shapes can only result from tensions that don't vary with direction. Malcolm Steinberg (and Scott Gilbert) became persuaded that convergence to any consistent geometry, via two or more alternative sequences of intermediate geometries, can only be caused by forces that are reversible, conservative and minimize free energy. Mathematicians tend to think that they somehow "own" the concept of tensors, think of them more in the sense of "transformation of number matrices", not as physical variables. The lecture on Monday February 11 stopped here. We will continue this topic in a future lecture. The notes that were on this page have been removed from now, since you will not be responsible for this material on the second hour exam.